February’s book of the month has special significance for me. It was translated by Robin Patterson, one of the nine volunteers who came to my rescue to convert Olinda Beja’s A casa do pastor into English when I was unable to find anything I could read from São Tomé and Príncipe back in 2012. At the time, Robin was just starting out as a translator, so it is wonderful to see his efforts come to fruition in this lovely edition of Our Musseque by Angolan writer José Luandino Vieira. In fact, I am doubly pleased to see this novel because, as I found with São Tomé and Príncipe, translations of literary works from Portuguese-speaking African nations are still very rare. So when Dedalus Books sent me a copy, I lost no time diving in. First published more than 40 years after Luandino Vieira wrote it in prison, the novel captures the experience of growing up in a musseque (shanty town) on the outskirts of Luanda. Thronged with vibrant characters, from the prostitute Albertina to the delinquent Zito and the alcoholic inventor manqué Mr Augusto, the book bustles with individual stories that surge and jostle against one another as the narrative builds towards its narrator’s – and the nation’s – coming of age when Angola’s War of Independence looms. As in Juan Tomás Ávila Laurel’s By Night the Mountain Burns, the oral tradition informs and shapes the text, filling each page with a clamour of voices. We quickly learn that the story is a collective endeavour with accounts perpetually contradicted, augmented and challenged by conflicting descriptions or subsequent events. Consequently, the question of truth-telling and the way stories are presented for different audiences are recurring themes, because, as the narrator concedes, ‘no one can tell where the truth ends and the lies begin’. This sense that stories are fluid, mutable things operates on all levels of the narrative. While the tone of the interconnected stories veers from lyrical to earthy – occasionally within a single paragraph – the chronology of events is complex, with the narration doubling back to fill in a gap or dodging ahead to something years in the future. According to Patterson’s Translator’s Note, Luandino Vieira took a similar approach to fact and fiction and even language itself in the novel. His childhood memories informed the book – the parish priest Father Neves, who appears in the story, really existed – and the original language of the narrative wove together Portuguese and Kimbundu to represent the way people spoke in Luanda’s shanty towns. Although Patterson decided not to attempt to recreate this blend in English, his melding of registers echoes that hybrid feel cleverly, capturing the disparate experiences and social situations in which the characters must present themselves. The result is a rich and involving piece of work that takes readers into the heart of the community it portrays. While those of us used to the conventions of the Anglo-European novel may find the fluid chronology and crowd of characters bewildering at points – we meet six in the first paragraph alone – the overall effect when you surrender yourself to the narrative is surprising, delightful and often profoundly moving. By the end of the book, we are nostalgic for a place we have never been. 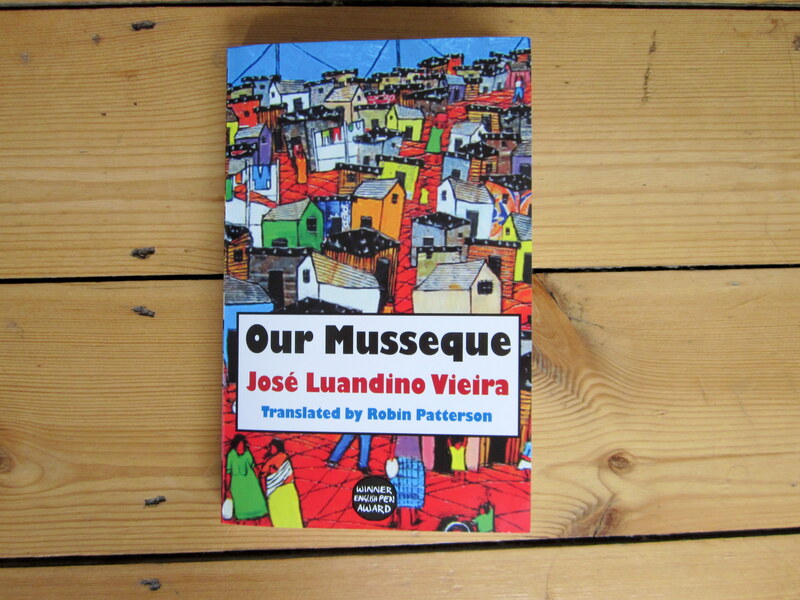 Our Musseque (Nosso musseque) by José Luandino Vieira, translated from the Portuguese by Robin Patterson (Dedalus, 2015). « What’s your favourite TED talk? I have enjoyed this month’s blog and put both down on my tbr list although every trip to library adds to the list. I read ‘Human Love’ by Andrei Makine for my Angola book (again not a native writer) but it gave a fascinating picture of the influence of the superpowers in African politics in 60’s and 70’s as civil wars rage. I’ve also just finished ‘Houseboy’ by Ferdinand Oyono for Cameroon humour in midst of colonial horrors and ‘When rain cloud father’s by Bessie Head for Botswana, it’s amazing how few African writers are promoted in mainstream literature. I’m looking forward to your next post. Happy reading! Thanks Andrew. I like the sound of your Cameroonian read – Cameroonian writers seem to do a good line in comedy (Mongo Beti was my choice). Yes, African writers are underrepresented in the Anglophone market. Hopefully that is changing though. Good luck with your literary adventures.